I am an assistant troop leader for my daughter’s Girl Scouts Daisy troop. Last night, they had an overnight lock-in at the Discovery Zone in Binghamton, NY. The day started out a little nerve-racking as the troop leader (who does both Brownies and Daisies) was sick and couldn’t attend. For our group of girls, I was the only parent there. However, we had 6 girls total and a few other troops were there with all their leaders and a few parents; everyone was really great and helpful. This was my first experience doing this. We arrived at the Discovery Zone at about 6:30ish. The girls dropped off their sleeping bags and they had dinner in one of the classrooms. Then, they were able to play around the center for about 1 hour and 30 minutes. Then, they went into another classroom to do some scheduled activities. That was followed by a question and answer style treasure hunt in the dark with flashlights! The girls were then able to have a popcorn snack before bed. For sleeping, the girls could sleep anywhere in the play museum (expect for up high or in a tunnel). In the morning, the girls woke up, had breakfast, and were able to play for about 30 minutes. And then, it was time to leave. I’m going to do a few more posts in a minute with pictures of the Discovery Zone, but it is a great place to go with your children for a fun filled day. As a parent, I love the fact that you get two-for-one. 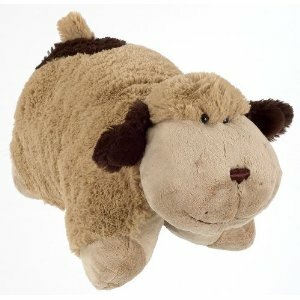 After all, it is a stuffed animal pet and a pillow rolled all into one. We are going to buy one of these for my daughter. Either for Christmas or for her birthday, which is in January. Here are a few pictures of her favorite. Links are also included so you can make a purchase from Amazon.com. 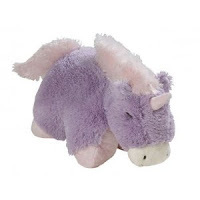 To buy directly from the company, please click here to visit the My Pillow Pets Website. 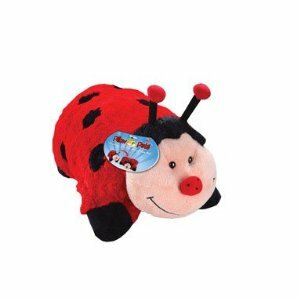 My Pillow Pets Miss Lady Bug 18"
Fun Field Trip for Kids: Science Center in Ithaca, NY! At the beginning of the school year, I was a chaperone for my daughter’s first grade field trip to the Science Center in Ithaca, NY. We have been to the Science Center many times before. We let our membership expire, but did we have one and used it often. There are A LOT more exhibits present than the ones picture below. I was actually having so much fun that I kept forgetting to take pictures. If you’d like more information on the Science Center in Ithaca, NY, please click the link to go directly to their website. I live in the Northeast and winter is almost in full swing. While I am not personally a fan of the cold, I love winter. There are so many fun things to do with my daughter. We are pretty excited because our new house comes with a giant backyard that happens to have a hill perfect for sledding smack dab in the middle of it! Sarah’s birthday is in January and she has already decided that she is going to have a sledding party. Other fun activities we enjoy include making snowmen, snow angels, snow forts, and having snowball fights! What is your child’s favorite winter activity? As a parent, one of my all-time favorite brands is that of Melissa and Doug. We have a number of Melissa and Doug toys in our home. All their products are fun for kids. As a parent, I love the strong quality of each item. If you are a parent who is looking for quality, fun, educational, and strongly built toys, I encourage you to checkout Melissa and Doug! Here are a few of our favorite toys and links to where you can purchase them from Amazon.com. 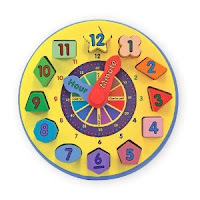 How neat is a toy that will help your child learn and practice their shapes, while also working on time telling! A toy that does double duty; you can’t beat that! Works as a traditional shape sorting toy. Your child can move the hour hand and the minute hand for fun with time. Made from wood, this unique and handy toy will last for years! 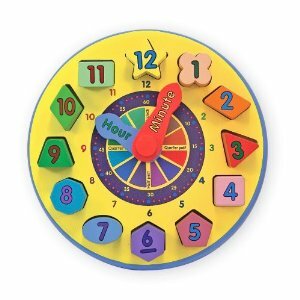 Average retail value of the Melissa and Doug Wooden Shape Sorting Clock is $14.99. 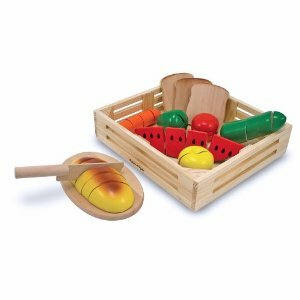 My daughter has a play kitchen and the majority of play food and accessories we have are from the Melissa and Doug brand. Once again, we keep returning to them due to their affordable prices and high quality products. The wooden food pieces look more realistic than the cheap plastic food pieces you can buy. The fact that you can “cut” them with the wooden knife is neat and perfect for true kitchen play. You can also incorporate a little math into your child’s day by educating them about counting and fractions when cutting each piece of food into pieces. Average retail value of the Melissa and Doug Cutting Food Box is $19.99. In our house, we are big magnet fans! My daughter loves to play with them on the fridge. I like it because I can easily keep a close eye on my daughter while cooking or doing dishes in the kitchen. Not only do you get 20 animal magnets, but a nice wooden storage box/cube. These magnets are decent sized too; not too small at all! 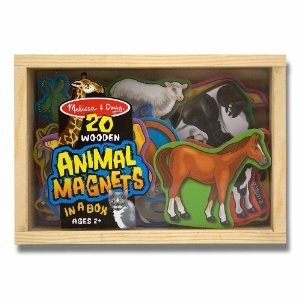 Average retail value of this Melissa and Doug 20 Animal Magnets in a Box is $11.99. Oh no! Another magnet set? This set is a bit different. Instead of fridge magnets, these are doll magnets. My daughter has this set and has played with it non-stop for almost a year now! 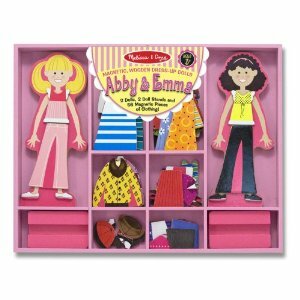 Your kit includes Abby and Emma, a wooden storage cube/box, along with a mixture of dress up clothes. These are magnetic, meaning they will stick to the dolls even when they are standing up! This kit comes with 60 pieces! There are so many different outfit combinations for your child to make. There are similar toys sold for boys, also by Melissa and Doug, such as this Melissa and Doug Joey Magnetic Dress-Up . I have just created a Twitter account for this blog/site. Please follow us on Twitter by visiting our profile page at http://twitter.com/preschoolreview. I will follow you back! SpongeBob Sorry is a Family Event! My daughter loves (and I mean loves) to play board games. We have at least 30 different games here. That gives me a great idea – review some! But anyways, back to the originally post. My brother moved out to Minnesota. He was a supervisor with Best Buy at a local store but has since gone to take a job at their corporate office. He came home for the holidays. And my daughter being the game lover she is, suggested he join her for a game of SpongeBob Sorry – two nights in a row! One night she won and the next he won. SpongeBob Sorry is just like the traditional Sorry game, but with a SpongeBob theme. We have had this game about a year now and the excitement hasn’t worn off on my daughter. We play it a couple of times every other week.